By definition, explorers face the unknown: that’s their motivation and their source of drive and energy. But the unknown includes risks – financial, personal, mental, emotional and physical. Take the American aviation pioneer Amelia Earhart for instance. She set many records, including becoming the first female aviator to fly solo across the Atlantic, and in 1937, as she was attempting to circumnavigate the globe, she regretfully disappeared over the Pacific. It’s because we pushed the limits and defied conventions - our plane, Solar Impulse 2, weighs the same as a car and has the wingspan of a Boeing 747! - that we were able to break 10 years of records and achieve the five-day, single pilot, non-stop flight, across the Pacific Ocean from Japan to Hawaii. But how did we, and how do other explorers, find the perseverance and the right level of energy to go forward into the unknown? How do we achieve what other people sometimes think impossible? There are moments in the life of explorers when critical decisions have to be made, decisions which will make the difference between success and failure and which can go against conventional wisdom. That’s the moment when explorers have to become leaders! To give you one example which happened during my flight from Japan to Hawaii: a few hours following the takeoff from Nagoya airport with Solar Impulse 2, I detected a failure in the system supervising the airplane while I rest. With a flight lasting at least 5 days and nights, and my being alone in the cockpit, this system was of crucial importance. When reaching the point of no return, as the system was still not functioning properly, all my engineers told me to return to Japan to fix the problem. But it was the first time that the weather over the Pacific was extremely favorable after 2 months of waiting and delaying our departure. So I looked at the question differently and found that the overall mission risk was reasonable, that I would find ways to compensate for the failed equipment. I decided to continue, which created a huge emotional reaction within the team. But it was the only way to make it possible. It was a tough decision but I felt deep down that it was the right moment. An explorer has a vision and the will to achieve it, but it is ultimately made possible by those around him. Building trust and confidence in the team is essential when managing high-risk actions in unknown fields. The Apollo 13 mission always comes to my mind when I talk about this. Two days after takeoff, one of the oxygen tanks of the space module exploded, which forced the mission to turn back. The crew was able to return safely to Earth solely thanks to the strong team spirit and trust the astronauts put in the engineers on the ground. To remind us that these are essentials when embarking on a pioneering adventure, we pinned the Apollo 13 badge to one of the walls of the Mission Control Center in Monaco. Explorers can only succeed if they are able to extract the best out of those around them. It’s a question of motivation and empowerment. Each person must understand their role in the adventure, be encouraged and recognized for their work. When the goal is so crisp and precise, all collaborators always have it in front of them. 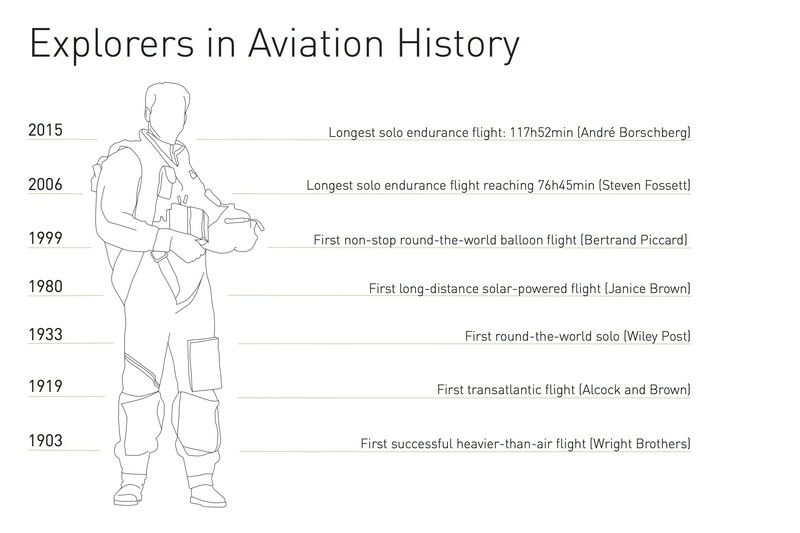 Engineers at Solar Impulse who built the plane knew that they were doing something revolutionary. Pilot safety became a primordial concern for everyone. The aim remained to continue exploring, however the safety of the pilots and the aircraft became their main focus. It made them so involved that, in a way, it turned them into co-owners of the project. Project ownership on an individual level makes the exploration a life venture for everyone involved. When flying with Solar Impulse 2 during missions, we rely heavily on the Mission Control Center (MCC). Located thousands of miles from the plane and the pilot, the MCC determines weather conditions, monitors the aircraft, and ensures the functioning of the system. They determine, day after day, hour after hour, the routine of the airplane, and also help to supervise it in order to identify any malfunction as early as possible. The stakes were high and I knew that everyone was doing their very best to ensure we succeeded. Everyone was so deeply concerned that I knew that if we did not make it it would not be because of a lack of perseverance or goodwill but because of destiny! The importance of taking a moment of reflection is crucial in a moment of extreme risk. In the end, every exploration experience depends on the person, and the true result comes from an inner-voyage. One way of preparing for risk is to prepare for the worst to make it less daunting. The knowledge that one can handle a very difficult situation (the need to eject oneself from the aircraft over the ocean) allows the anxiety that one previously had to decrease, and makes room to focus on the present. What I also find helpful is to become an observer of oneself, observing one’s own reactions, behaviors, and feelings. To practice this skill, I found yoga and meditation to be very good tools. Yoga is not just another type of exercise, it’s the development of a state of mind, of aligning the mind with the body. Observation of oneself is part of this training, to see how our own body reacts when taking a posture, how we breath, how we feel. And this is exactly what needs to be done when confronted to a stressful situation.